« Small Business in need of Finance? 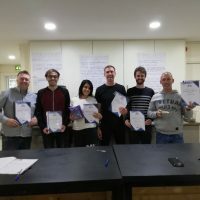 Congratulations to the first five participants who successfully completed Barista Skills Training under the guidance of Seamus Doyle of Fintan Stanley Ltd.
Clients of Waterford Area Partnership Clg have been asking for skills in this area to enhance employment opportunities in the ever growing café business. “The course was very interesting and good fun; I learnt a lot and made myself a great Americano” said one participant.